There's just enough garlic in this to practically kill most any virus. Or at least keep people far enough away you won't infect them! Cheddar cheese soup, broccoli cheese soup, and fiesta nacho cheese soup. Those are the products in the Campbell’s Soup “cheese” soup lineup. I know I’ve looked at them several times and thought... Well, I won't say exactly what I thought, but it wasn't good. They sort of turned me off. called the "Queen of Greens" and "a nutritional powerhouse." Don’t get me wrong, I love cheese sauce on vegetables. I just can’t picture it in a canned soup. At least I couldn’t picture it in a soup until now. This was a completely unexpected result. There actually are some interesting cheese soups, but none are made by Campbell’s. How about celeriac, pear and blue cheese or maybe porter beer and balderson soups? French onion soup has cheese "on" it and I thoroughly enjoy that. In fact I have an excellent recipe. The spouse doesn’t like onion soup so I haven’t made it for quite some time. The cheese is gruyere, and it’s on toasted bread. I don’t know how “cheddary” the Campbell’s soups are, but this soup has just enough cheddar to taste. No more. It’s certainly not a cheese “sauce.” But you can tell it’s there, once you’re told. Before then it just seems like an incredibly tasty, complex broth. There is a lot going on in this soup, and most of the action is in the liquid. Other than the broth there’s chicken and kale. 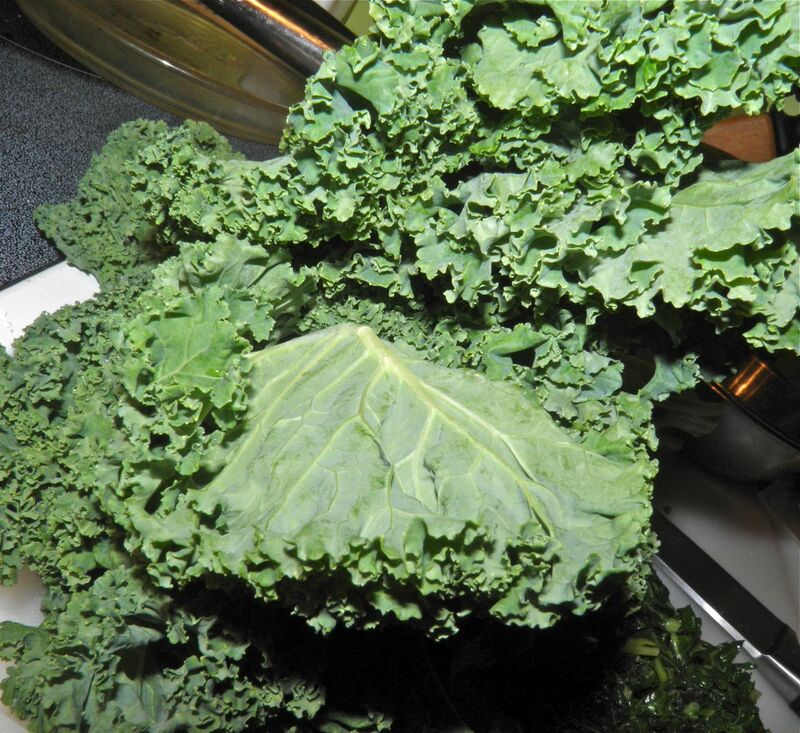 Kale is full of iron and very healthy for you. So what exactly is in this “cheddar” soup. A lot of garlic. At least 10 cloves. And celery, carrot and onion. Once cooked they are puréed into an amazingly deep and delicious creamy base for this soup. A little evaporated milk and cheddar are stirred in and that’s about it. I love evaporated milk in soup and chowder far more than cream. I think it has something to do with mouth feel. Whatever happens in this soup, it certainly is good. It’s a bit strange because for something so wonderful there’s not a long list of ingredients, and no complex preparation. 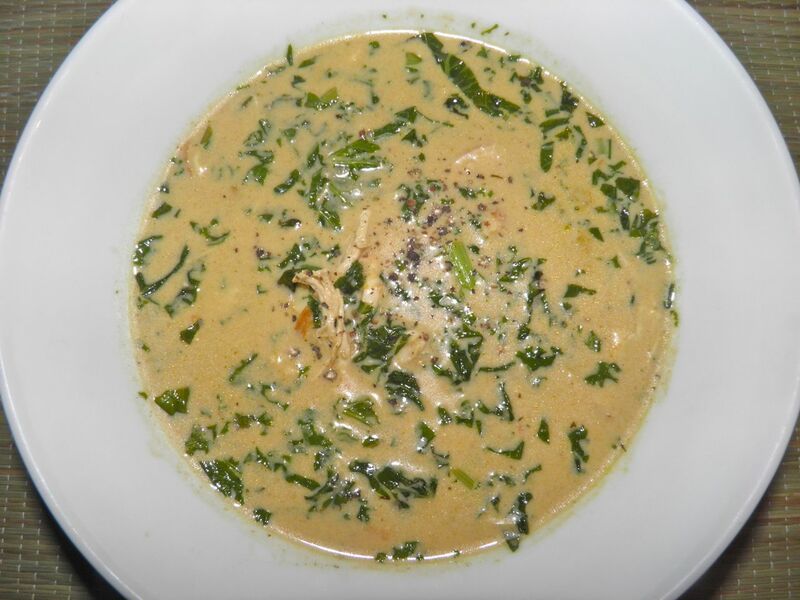 If you want a bowl of chicken soup to drive away the winer blues look no further. You’ve found it. pieces. Far nicer than chopped in this soup. Wash and chop the kale. Set aside. Peel and chop the garlic cloves. Dice the onion, carrot and celery. Melt the butter in a stock pot. Add the chicken breasts and sear until brown on both sides. Sprinkle with salt and pepper while they sear. Remove to a dish. Add the kale to the pot and let "fry" for 3-4 minutes, until slightly wilted. Remove to the dish with the chicken. If necessary, add a little more butter to the pan. Add the garlic and vegetables and sauté for 3-4 minutes until very fragrant. Pour the chicken broth over the top, add the pepper and thyme, and bring to a boil. 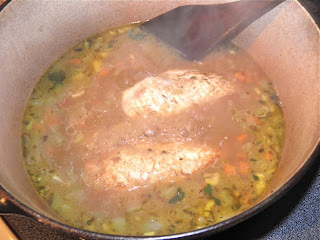 Add the chicken breasts to the pot, cover and cook for 10-12 minutes. Remove the breasts and purée the vegetable/broth mixer until smooth. Shred the chicken with two forks. 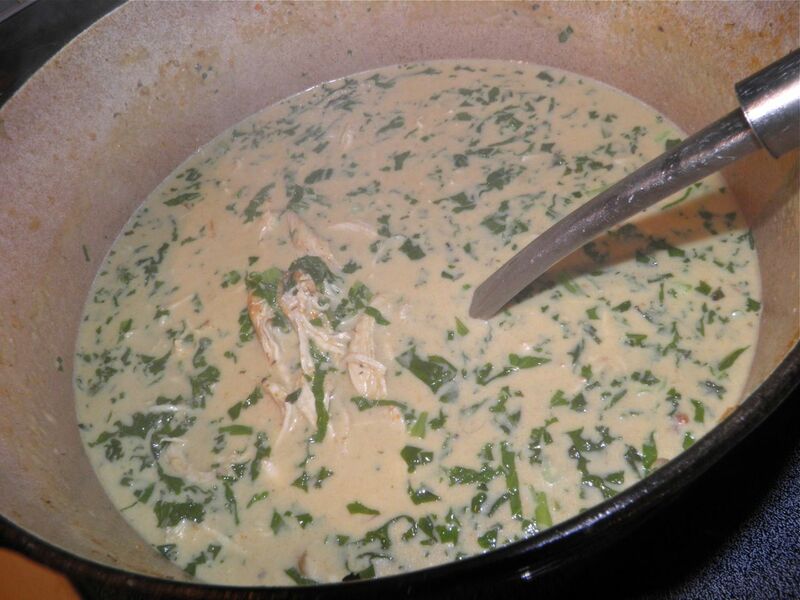 Add the evaporated milk and taste for salt and pepper. Adjust if desired. Chop the kale finely and add back to the pot. Then add the chicken and cheddar to the soup. Stir until just to a boil. Remove from the heat. Serve with crusty bread. Grate a little more cheese on top, if you wish.